Once you have designed your home, whether it is log, timber frame, hybrid, or completely custom and drawings are complete, a contents package is generated from that design. The following two packages are sample premium contents packages. These are packages, available through Bear’s Den Log Homes in GA and NC, from Honest Abe Log Homes. When it comes time to turn your plans into reality, we believe in using only the finest kiln-dried logs for our luxury log homes. Our craftsmen have spent years learning how to select the most suitable species of wood for log home construction. From cutting and planning to notching and measuring, each step is vital to producing the perfect construction package, but perhaps none more so than properly kiln dried logs. We start by selecting only the highest quality Eastern White Pine. To minimize movement, shrinkage, and settling in the timbers over time, we combine natural air drying and kiln drying in the manufacturing of every single Honest Abe timber. The drying process produces a more stable log and tighter joints for the construction of your handcrafted log home. By kiln-drying our logs, we remove moisture trapped inside, as well as any insects or larvae. We use large, variable temperature kilns to dry hundreds of logs at a time. Once stacked inside the kiln, the logs remain there for approximately three to five weeks. During this time, the temperature inside the kiln is slowly raised to around 170 degrees as computer-controlled fans and moisture meters dry and monitor the logs. The goal of this thorough drying process is to reach a moisture-content level that is best for the majority of our building sites. The dried logs are also better prepared to receive stains and preservatives you may choose to apply. As always, each of our timbers is stamped to meet national codes. a. Kiln-dried logs are “pre-shrunk” before milling to a final profile. This process provides a uniform and stable log wall system with less settling and tighter joints. In fact, throughout much of the United States, Honest Abe’s log wall system will qualify as a “non-settling” system. However, years of experience have taught us how to create a building method to account for minor changes in the wood. b. Careful drying in a controlled environment minimized checking (cracking), which occurs in the kilns, before milling and final construction. c. After kiln-drying the logs, trained inspectors can grade defective logs out. Logs used in the home package are stamped with a TPI standard of LogWall-40. d. Heat from kiln-drying will destroy mold, fungi which causes wood decay, as well as any insects, their eggs or larvae. e. Most pitch in the wood is crystallized during kiln drying, preventing “sap” from seeping to the surface after the home is constructed. f. Interior and exterior finishes can be applied immediately following construction for more convenient and immediate protection. Applications may absorb deeper and last longer. g. It’s estimated that 10,000 pounds of water are removed from the typical home, significantly reducing the weight of the logs. Two people can handle even the longest logs during the construction process. 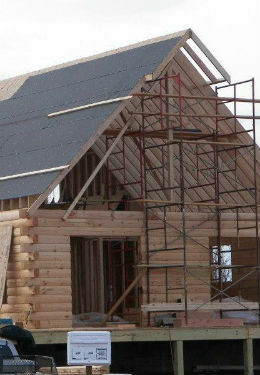 Honest Abe custom log homes are constructed using Eastern White Pine and Douglas Fir. 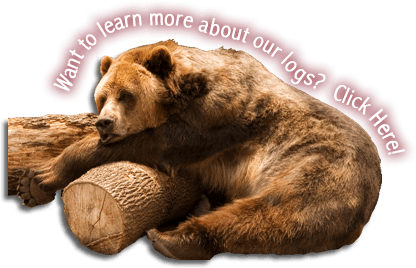 See below for more information about the benefits of using these woods in the manufacture of your log home. Stable. White Pine doesn’t shrink or swell significantly with changes in moisture. Plentiful. Is a major species for reforestation. 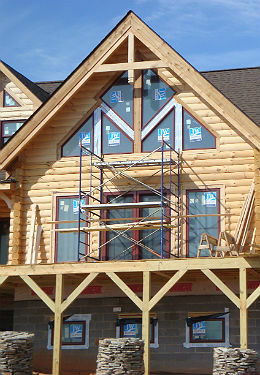 One of the most used wood species in the log home industry. One of the highest R-values of all wood species. Easy to work and mill. Warps and checks less than other species. Uses include wall logs, log sidings, support posts, blocking, porch posts, porch plates, porch rafters, railings, and trim. Honest Abe’s first packages were manufactured with Yellow Poplar logs. Poplar was readily available and was traditionally utilized by the early settlers in eastern Appalachia. Needing a market for poplar logs, log homes seemed a perfect fit. However, the poplar was difficult to work, checked excessively, and was hard to get in longer lengths. Other wood species were tried. Yellow pine, still in use today by many companies, twisted and warped. Hemlock, another species, was difficult to mill and was prone to splintering. Eastern White Pine proved to be the wood with the most favorable characteristics and has been used exclusively since. Most plentiful of all North American softwood species. Naturally dimensionally stable. Has the ability to season well in position. Superior strength to weight ratio. Excellent nail and plate holding capacity. High degree of resistance to deflection. Important in the design of floor and roof systems. Documented superior performance against natural forces such as winds, storms, and earthquakes. Peace of mind in potentially dangerous situations. Knots less likely to loosen or fall out. Uses include heavy timber rafters, collar ties, wall-tie trusses, ceiling beams, girders and timber frame components. “Darlene and Bear’s Den was the third Asheville area log home company I had looked at to build with and I knew right away she was the representative for me when we met. I am extremely happy that my vision was put to a plan and it is my log home exactly as I had envisioned it! ” ~ Cathi C.